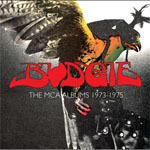 Share the post "Album review: BUDGIE – The MCA Albums 1973-1975"
This straightforward, budget-priced, three album box set arguably misses out on Budgie’s “finest hour” or two hours if you count the band’s second album ‘Squawk’. One wonders if the first two albums will be reissued in this format as both were originally on MCA, and it therefore begs the question why we couldn’t have had one boxed set “The MCA Years 1971-1975″ as it would then be really all the Budgie you ever need. The three albums are remastered and reissued in facsimilie gatefold sleeves with a new essay giving the background, by the omnipresent Malcolm Dome. Never Turn Your Back On A Friend (1973) was the band’s first self-production and the last to feature drummer Ray Phillips. It featured a wonderful Roger Dean gatefold sleeve and moves up again in recording quality – 24 track this time. And it is, perhaps, the band’s most accessible album. ‘Breadfan’ opens at a frenetic pace. ‘Baby Please Don’t Go’ is one of their few covers with screaming fretwork and Burke Shelley’s almost impossibly pitched vocals. ‘I Know I’ll Always Love You’ and ‘Riding My Nightmare’, typically skilful ballads. 1974′s In For The Kill saw the band’s first line up change with Pete Boot stepping behind the drum kit. Due to constant touring, the band didn’t have a lot of material available and were under record company pressure to come up with another album. The album opens with a thundering title track, followed by the equally wonderful ‘Crash Course In Brain Surgery’ although this was a ‘left over’ from the first album sessions. Bandolier (1975) saw Steve Williams claim the drum seat and a return to more original songwriting. But is has a typical mid-1970s commerciality to it – not dissimilar, in many ways, to contemporary Thin Lizzy. The band struggled on in the late seventies, releasing five more albums but never furthering their original impact and they’ve largely been remembered for influencing a generation of heavy rockers, including Metallica. This set is a fair, if incomplete, introduction to Budgie but completists might also want to check out the individual album reissues in 2005 on the band’s own label which contained welcome if limited bonus material. This entry was posted in ALBUM REVIEWS, ALBUM REVIEWS (Mobile), All Posts, Reissues and tagged Bandolier, box set, Budgie, heavy rock, In For The Kill, Never Turn Your Back On A Friend, The MCA Years 1973-1975. Bookmark the permalink.